With our diverse range of capabilities, CFW Precision Metal Components is an expert provider of sheet metal fabrications. From projects that involve making a few simple bends in a blanked metal pattern to those with complex welding and structural requirements, we have the skills and equipment to fulfill your needs. Our facility houses all of the different types of equipment that you would expect to see on the floor of an experienced fabrication shop. In addition to press brakes, turret presses, and bending machinery, we are outfitted with high-powered shears, forming presses, piercing machinery, spot and resistance welding equipment, and much more. With bending capacity of 39.0”, we specialize in producing smaller-sized metal fabrications from sheet materials measuring up to .188” in thickness. Using both CNC controlled and manually guided fabrication equipment, we process all types of metal, including architectural grades, heat resistant alloys, perforated sheet, and many others. 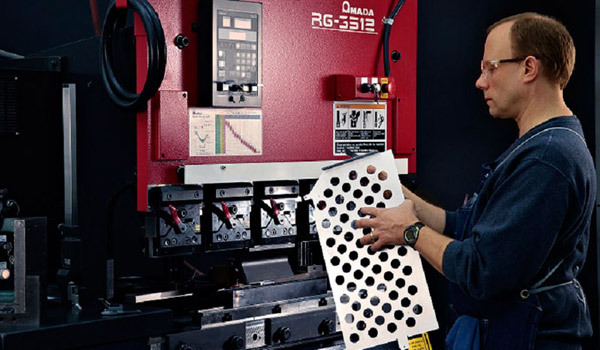 Our production resources allow us to fabricate close-tolerance workpieces that meet the high standards of quality required by the electronics, aerospace, military, marine, and commercial industries. We have a strong background using sheet metal fabrication for prototype development. The versatility of our sheet metal fabrication capabilities expedites the production of sample parts so that the design, form, fit, function, and manufacturability can be tested, analyzed, and verified. We focus on understanding your product application, cost constraints, quality objectives, and any other aspects of concern so we can provide you with exactly what you need within your budgetary guidelines. For more detailed information about our ISO 9001 certified sheet metal fabrication services or to obtain a quote, Contact us today.